In 1780 Elizabeth Gurney was born in Norwich into a rich Quaker family. Elizabeth came from a rich family because her mother was part of the Barclays family (Barclay’s bank). Her husband and father were both bankers as well. Elizabeth had 11 children, but her daughter Betsy died at the age of five. Elizabeth’s mother died when Elizabeth was only twelve years old. As one of the oldest girls in the family, Elizabeth cared for the younger children, including her brother Joseph. At 18 years old, the young Elizabeth was deeply moved by the preaching of William Savery, an American Quaker. She collected old clothes for the poor, visited those who were sick in her neighbourhood, and started a Sunday school in the summer house to teach children to read. Motivated by the words of William Savery she took an interest in the poor, the sick, and the prisoners. Encouraged by a family friend, Elizabeth visited Newgate prison. Prison conditions horrified her. The women's section was overcrowded with women and children, some of whom had not even received a trial. Women and children did their own cooking and washing in the small cells in which they slept. At that time, people in England could be executed for over 200 crimes. Elizabeth Fry and her brother, Joseph John Gurney, took up the cause of abolishing capital punishment (hanging). Some people criticized her for having such an influential role as a woman. Others alleged that she was neglecting her duties as a wife and mother in order to conduct her humanitarian (caring) work. 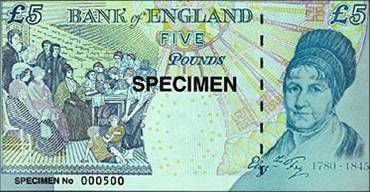 The design on the former English £5 note shown above also shows a key, which is a symbol of the key to the prison which was awarded to Elizabeth Fry in recognition of her work. Fry was depicted on the reverse of £5 notes between 2002 and 2016. She was shown reading to prisoners at Newgate Prison. There is an Elizabeth Fry Ward in Basildon Hospital in Basildon, Essex. Her whole life was dedicated to the poor until she died from a stroke in Ramsgate, England, on 12 October 1845.